FOR SALE NEW AND UNUSED C&K 1 POSITION KEYLOCK SWITCH WITH 2 KEYS INCLUDED. PLACE YOUR MOUSE OVER PHOTO TO ZOOM IN. WHAT YOU SEE IS WHAT YOU WILL GET. You are purchasing part number 3.14.001.006/0000 Manufactured by RAFI. Illumination : Non Illuminated. SWITCH KEY NON-ILLUMINATED SILVER. Actuation Type : Top. 15A 250V AC T125 VDE 4715UG. 15A 125-250V AC 65C UL E91973CSA LR98589-1. Actuator: Nylon 6.6 - V Stainless Steel. Actuator: Red w/ Black Shroud. 1/2HP 125-250V AC UL/CSA. Action: Normally Open/Closed. The keys can be taken off(out) when the switch stays on or off position. Mounting Hole:12mm. This key switch with on/off positions. Position:2(ON-OFF). 1 × Switch. Insulation Resistance:≥100MΩ at 500VDC. Specification: Description: Feature with right angle. Tongue operated Safety Interlock Switches are designed to fit to the leading edge of sliding, hinged or lift-off machine guards to provide positively operated . Electrical Life:≥10000 Cycles. The keys can be taken off(out) when the switch stays on or off position. Mounting Hole:12mm. This key switch with on/off positions. Position:2(ON-OFF). 5 × Switch. Description: With NO/NC type, key lock rotary switch. Widely used for electrical automatic control circuit for send out control signal. Specification: Description: Zinc alloy die cast housing,2 terminals, in both positions, (Off-On). Keyed can be taken off when the switch stays on or off position. 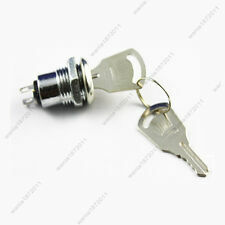 Miniature keylock switch for simple locking and switching tasks. .
1 Piece of Electric Keylock Switch. - Rated heating current: 1A. - Working current: 1A. Cell Phones & Accessoris. - Product Type: Key lock switch. Electrical & Solar. - Protection: protection type. - Mode of operation: key. Specification: Description: Zinc alloy die cast housing, four terminals, in both positions, (Off-On). Keyed can be taken off when the switch stays on or off position. 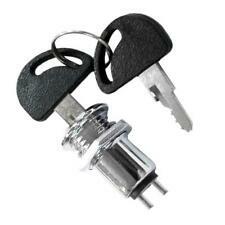 Miniature keylock switch for simple locking and switching tasks. . Description: Features Two terminals, in both positions. Keyed can be taken off when the switch stays on or off position. Miniature keylock switch for simple locking and switching tasks. Note: This KEY design is not for security reason, it is just a design to prevent unintentional switching--to actuate the switch you have to insert a key into the switch instead of push a button which anybody could do by mistake, in some cases one keylock switch may be by the key of another set,if you buy more than one set , please note we can not ensure very keylock has its unique keys. Specifications: Description: Features 2 positions, 4 screw terminals, key lock type, etc. Easy to install. Used to control circuits in electromagnetic starters, contactors, relays and so on. Note: Please notice the voltage before ordering and make sure it can work in your erea. Specification: Description: Tongue operated Safety Interlock Switches are designed to fit to the leading edge of sliding, hinged or lift-off machine guards to provide positively operated . 1 Piece of Electric Keylock Switch. - Rated heating current: 1A. - Working current: 1A. - Product Type: Key lock switch. - Mode of operation: key. - Protection: protection type. 1 Piece of Electric Keylock Switch. - Rated heating current: 1A. - Working current: 1A. - Product Type: Key lock switch. Don't hesitate to buy, you will get the following item. - Protection: protection type. 1 Piece of Electric Keylock Switch. - Rated heating current: 1A. - Working current: 1A. - Product Type: Key lock switch. - Mode of operation: key. 1 Piece of Electric Keylock Switch. - Rated heating current: 1A. - Working current: 1A. - Product Type: Key lock switch. - Model: PBM-19. 30MM KEY SELECTOR SWITCH 3-POSITION. Benefits: Available worldwide, Proven robustness. o Contents: 1 KEY SELECTOR SWITCH. o Switching function latching: Yes. o Colour button: Silver. o Type of operator: Stay put. 1 Piece of Electric Keylock Switch. - Rated heating current: 1A. - Working current: 1A. - Mode of operation: key. - Product Type: Key lock switch. - Protection: protection type. 1 Piece of Electric Keylock Switch. - Rated heating current: 1A. - Working current: 1A. - Product Type: Key lock switch. I am sure it the right thing you need now. 1 Piece of Electric Keylock Switch. - Rated heating current: 1A. - Working current: 1A. - Product Type: Key lock switch. Good quality! Excellent Service! 1 Piece of Electric Keylock Switch. - Rated heating current: 1A. - Working current: 1A. - Product Type: Key lock switch. - Protection: protection type. - Mode of operation: key.